Specialist builders for quality boulder and quarry rock retaining walls for domestic and commercial applications. We supply and install quality sandstone, granite, basalt and Mudstone. Whether you have an idea in mind, or need some plans drawn up, Diamond Earthmovers Have you covered. Our team of experienced landscapers Can Create or turn an ugly rock wall Into a statement piece that will have your friends talking. 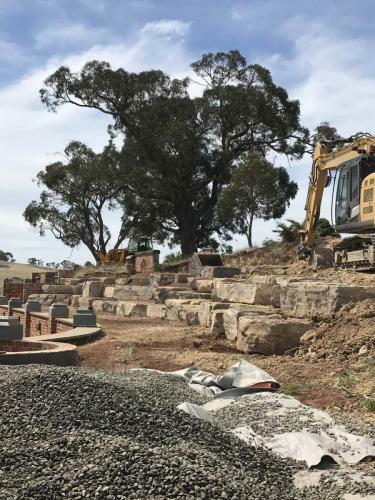 Our specialist builders can help you construct high quality boulder and quarry rock retaining walls for domestic and commercial applications. We supply and install quality sandstone, granite, basalt and Mudstone rock retaining walls. Whether you have a certain idea in mind, or need some plans drawn up, the team at Diamond Earthmovers have got you covered. Our experienced contractors can create or turn any unappealing rock wall into a stunning statement piece that will have your friends talking. Functional: For decorative purposes or keeping dirt and soil at bay, our rock retaining walls are made strong. Durable: Our team will ensure that your retaining walls are made to last and withstand the weather. Low Maintenance: Strong and sturdy, you will not need to worry about performing any extra maintenance. Visually Appealing: If you are selling your property, our rock retaining walls will enhance the aesthetic appeal, potentially boosting your property value. Whether you are on a farm, remote rural town or in suburbia, our team have got you covered. All our services are available to clients in metropolitan Melbourne and rural areas in greater Victoria. Contact us to discuss your needs in regards to your rock retaining walls and landscaping. 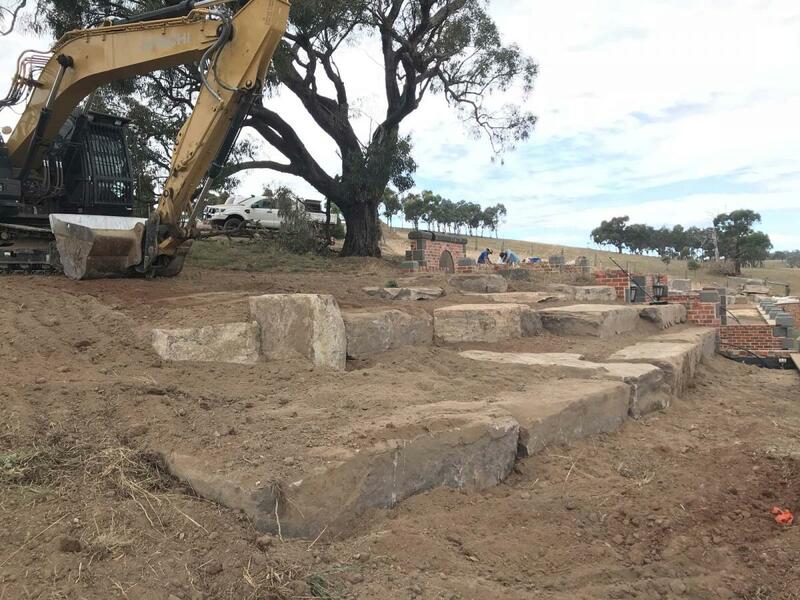 We are experts in building rock retaining walls and earthmoving services for Melbourne’s domestic, commercial and industrial sectors. No matter what type of outdoor living space or property you own, you can always rely on us at Diamond Earthmovers Pty Ltd for a high level of customer service. We will always start you off with a professional consultation and a free quote - for any of our services in Melbourne and rural Victoria. Throughout the duration of a project our friendly team are always willing to answer questions and keep you updated throughout every stage of your project. Get your free, no obligation quote on rock retaining wall services by filling out the form below or get in contact with our friendly Melbourne team today. 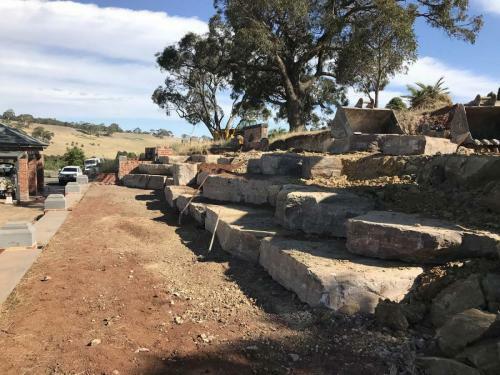 Contact the Diamond Earthmovers team if you require any of the following services in addition to your rock retaining wall job and we will discuss your available options with you. If you would like to discuss your situation and rock retaining wall or landscaping needs in greater detail, contact the Melbourne experts at Diamond Earthmovers today. We can help you understand the processes necessary for your project, timing and costs involved and set you up with a free quotation so you know exactly what to expect. Whether you have an idea in mind or need some plans drawn up, Diamond Earthmovers have you covered. Our team of experienced landscapers will be with you from the very beginning to the very end; listening to your requests and providing with sound advice, so you can get the rock retaining walls you want. Speak to one of our experts today on 0404 497 97. Are you planning to build some rock retaining walls for your property, but don’t have the machinery for it? Is the project too big that you might need a helping hand? Looking for some experienced professionals to help you? Diamond Earthmovers are the specialist builders that can help you with all your rock retaining walls projects. Whether you need it for domestic or commercial interests, our experience, knowledge and passion will see us deliver it. It doesn’t matter the size of your project, we will deliver the results you want for it. What Does Our Rock Retaining Walls Service Include? We are the specialist builders for quality boulder and quarry rock retaining walls for domestic and commercial projects. We have a wide range of stones in our possession that can be used for your project. We supply and install quality sandstone, granite, basalt and mudstone. You have the choice of what you would like and we will do the rest. Whether you have an idea in mind or need some plans drawn up, Diamond Earthmovers have you covered. Our team of experienced landscapers can create or turn an ugly rock wall into a statement piece that will have your friends talking! Contact us for more information!